What can we do to get more women in Tech? With your help and participation, this SXSW panel of allstars will answer this question and make the case for mentorship. Save the date: Tech Superwomen, Mentors and Mentees, FTW – taking place in Austin, Texas on Saturday, March 10 at 9:30 a.m., in the Austin Convention Center (room 9 ABC). Emigrating from Russia and working hard to ascend into the tech field, Ekaterina is a true advocate and go-getter. She will discuss the key role building great relationships played in her success and share tips for building such partnerships. Co-founder of a major tech web firm at the age of 25, this millennial super-star will share her unique perspective on how to co-mentor and share how male mentors have played a key role in her journey thus far. Corporate board director for a NASDAQ traded company, HBR writer and TEDx speaker, Nilofer is a heavyweight mentor and champion (just ask Tara Hunt). She will discuss the benefits of being a mentor and provide a framework for consideration when deciding to mentor someone. Author, content strategist and advocate for mentorship, Margot practices what she preaches and will share how mentoring can be a great way to find future talent for your organization. Panel organizer and moderator, I hail from Alaska and will share how to go about getting remote mentors and how geography is not a limitation, but can actually be a benefit. What’s on your mind? What do you want to know as someone looking for a mentor or looking to be a mentor? We want your voice, questions and insight! Join us by either following the hashtag (#SXtxsw), posting a comment below, or engaging in Austin for this critical discussion with a truly dynamic line-up. 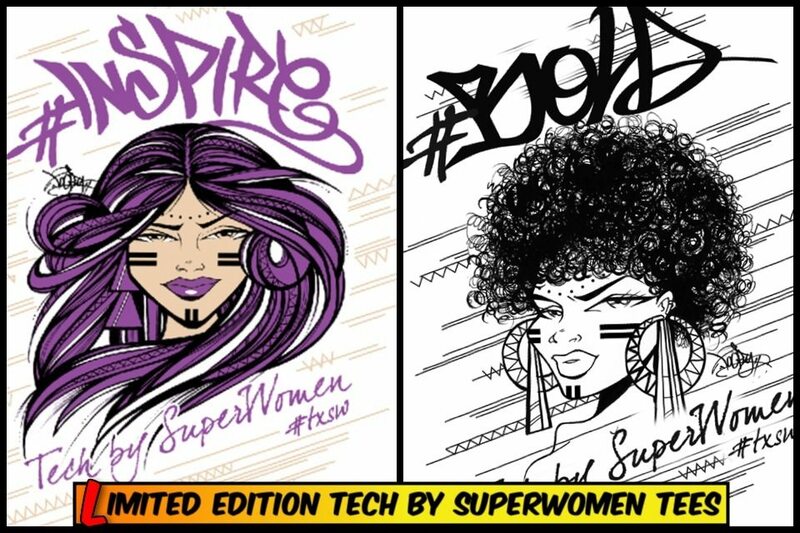 Limited edition Tech By Superwomen Tees, featuring the artwork of Maria Toofly Castillo. limited edition Tech By Superwomen Tees, featuring artwork by Maria Toofly Castillo. Special thanks to Meshin for sponsoring the Tee giveaways, keep your eye out for a post on the amazing co-founder and tech superwoman – Kristen Galliani. Plus, I am cooking up an anthem playlist jam-packed with great tunes to set the tone for this interactive conversation.